** SITEMASTERS NOTE ** The author of this work is involved in Occultic/New Age practices and beliefs; however, I include this extract here due to the interesting information and observations contained within. I do NOT under any circumstances support, adhere to or condone any occultic or New Age practices. In this page we take a look at the marvel of construction that is the Great Pyramid. We look in some detail at the dimensions of this structure and realise that there must be much more to this building than just an ancient tomb for an Egyptian Pharaoh. On an arid, desolate plateau in Northern Africa lies arguably the most incredibly precise structure in the world. A design so perfect that many have thought only a deity could have created it. A memory of an improbable and distant past held fast in granite and limestone, yet at the very same time a massive and enduring signpost to the future.For centuries the pyramids of Egypt have created more debate and more controversy than just about any other structures on Earth. From the now distant Herodotus to the more recent Petrie, Borchardt, Reisner, Jequier, Vyse and Perring, Firth, Quibell, Taylor, Piazzi Smyth, Edgar Stewart and Morton Edgar, (this is very much a short list) all have contributed. Some, indeed most, would have devoted their whole lives to solving this riddle of the ages. Yet, as is sadly common in most human endeavour of a controversial nature, very little consensus has ultimately emerged. However because of the intense and one might say even furious activity that has surrounded the exploration and examination of these relics of the distant past one undeniable truth that has emerged. That reality is that the actual dimensions of the Great Pyramid are no longer in any question. The purpose and intent of the Great Pyramid may still lie shrouded in mystery but its actual measurements are now so refined that there cannot be any question about them. The repeated efforts of a cavalcade of experts over nearly two centuries has made the dimensions of the Great Pyramid now a fully documented and undeniable fact. It is with these irrefutable determinations that the writer intends to establish his case. It is not intended to enter into any of the many debates about the pyramid but instead to present a rationalisation based on a simple and seemingly undeniable argument. An argument that stems solely from the absolute veracity of the measurements now so specifically established. Firstly though it should be recognised that the majority of egyptologists and archaeologists do not consider that the ancient Egyptians possessed any wonderful and special skills to enable them to build a structure as unique as the Great Pyramid. To them the idea that anyone should believe such a fantasy is both laughable and lunatic. In fact the attitude to all pyramidologists, of which the writer would claim to be in the junior ranks, is that they are at best misguided and at worst plain idiots.. For the archaeologist then the designation of Pyramidiot, describing all pyramidologists, succinctly describes the nature of the beast. Therefore as the egyptologist and the archaeologist represent the views of authority and academia it is not surprising that the majority of the population also tend to adopt the view that the pyramids of Egypt were but tombs and the burial places of the pharoahs and that is where the matter rests and has rested for many, many years. This attitude prevails in all aspects of the pyramid, including the most basic of discoveries, so when the words prediction and precognition are uttered the response is quite naturally derisive in the extreme. Hopefully the reader will be less dismissive of the idea that the Great Pyramid was more time capsule than it was monument. The precise location and placement of the Great Pyramid on Earth give us the first pointer to it being a building of supreme importance. For it is located on the longest land contact meridian on the Earth's surface and is placed at the geographical centre of the total land mass of the Earth. If one is to send a message the prime requirement is of course that people will read it, it is no good putting it in a bottle, throwing it in the ocean and then hoping it will be found. One must place the message somewhere where it simply cannot be missed, a place so significant that its very location makes a notable statement in itself. Also once there it must be in such a form that people will, out of pure curiosity, attempt to decipher it. Professor Piazzi Smyth one of the first of the recent pyramid investigators made some extraordinary discoveries about the absolute sighting and location of the Great Pyramid. He found that the latitude of its site 30 degrees north, is exactly one third of the distance from the Equator to the North Pole. Placed at the northern extremity of a range of hills commanding the entire plain of Lower Egypt, the Great Pyramid stands at the very centre of Egypt at a place that could also be described as the centre of the world. In 1868 the chief hydrographer to the United States Coast Survey, Mr Henry Mitchell was impressed with the regularity of the circular coastline of Lower Egypt and wondered if he were to complete the circle, where the centre of it would fall, it fell, as we might expect, at the very site of the Great Pyramid. In that day shall there be an altar to the Lord in the midst of the land of Egypt, and a pillar at the border thereof to the Lord. And it shall be a sign and for a witness unto the Lord of hosts in the land of Egypt: for they shall cry unto the Lord because of the oppressors, and he shall send them a saviour, and a great one, and he shall deliver them. William Petrie another pyramidologist showed that the meridian line that runs due north and south and bisects the base of the pyramid, contains more land and less sea than any other. He also showed that the latitude, 30 degrees north also contains more land and less sea than any other. Thus the Great Pyramid can be said to be at the very centre of the land mass of the Earth. The Great Pyramid located as it is at the virtual center of the Earths land mass and at the centre of Egypt is built upon the Giza plateau. The Giza plateau not only provides a natural elevation, but also it seems, it played a very significant role in the construction of this ancient edifice. For only this decade was it realised that the major source of the stone for this mammoth pyramid came from the very plateau on which the Great Pyramid stands. This discovery was only made a few years ago by a BBC Television crew. The accuracy of alignment is the next thing we must consider. It is aligned to within one twelfth of a degree to the cardinal points of the compass. This error is probably due more to the gradual shift of the Earth's axis since the pyramid was built than any error in the pyramid's original alignment. The design of the Pyramid was such that was able to model a globe. This may only occur at a precise pyramid slope angle of 51 degrees 51 minutes 14 seconds, the Great Pyramid has this very same slope angle. This is because the ratio of the pyramid height to its base perimeter is exactly twice pi. Put another way as the height of the pyramid is to its perimeter at its base then so is the radius of a circle to the circle's circumference. This ratio can only be achieved at the exact angle of 51 degrees 51 minutes 14 seconds. Kurt Mendelssohn in his book "The Riddle of the Pyramids" showed that a lower angle of 43 degrees 30 minutes was used in some pyramids to overcome construction problems. If a span of only 10 degrees is allowed to set the pyramid slope angle and 43 degrees 30 is used as the lower limit then the chance that the angle 51 degrees 51 14 was selected fortuitously is 36,000 to 1, very long odds indeed. The Great Pyramid not only reflects the Earth in volume and area but also in weight, for its estimated mass of 5.955 Million tonnes is approximately one billionth of the estimated mass of the Earth. (5.9 x 10 21 tonnes). The Fibonacci series is a sequence of numbers starting 0, 1, 1, 2, 3, 5, 8, 13, 21, 34, 55, 89, etc. Each number equals the sum of it's two predecessors. It is found much in nature in things like the design of fir cones and the arrangement of flower petals. An analysis of the Fibonacci series reveals that it is ultimately based on the Phi-ratio or the number 1.61803+, the Phi-ratio may be better known as the Golden Section. The Golden Section is a ratio of the length of a rectangle to its width, a ratio that is particularly pleasing to the eye. The Golden Section is found much in architecture, an example is in the Athenian Parthenon. The Great Pyramid embodies a direct expression of the Phi-ratio, being 0.001 of 1.61803+. This is amplified by John Ivimy in his book "The Sphinx and the Megaliths" in which he states that if one assumes a measure of 4 Royal Cubits the slope height of the Great Pyramid becomes the number 89 and the half base becomes the number 55. These are two successive numbers in the Fibonacci Series. A logarithmic spiral could be used to visualise the Fibonacci series. The radii of the successive quarter turns of the spiral are formed from or based on the succession of numbers in the series. A Nautilus shell is natures own version of the Fibonacci Series of numbers in action. This is but one example of how the Fibonacci Series reflects many patterns and themes of nature. However this revelation reveals a further ethic to the message of the Great Pyramid, for where the Pi ratio and its derivatives gave a global inference to the design, the Phi-ratio and the Fibonacci series refine this message to make some connection to the spiral of life. It does not take too much of a leap of the imagination to make a connection with the concept of Man's ascent through the ages. It is also important to realise that at the time when the archaeologists tell us this structure was built, some 2600 BC, the ancient Egyptians had not resolved the number of pi or (3.141592654) to better than 3, indeed if they had resolved it at all. And even a full millennium later their realisation of pi was still extremely primitive. The map of the previous page shows in some detail the arrangement of the pyramids on the Giza Plateau. The map is a copy of an old map by Davidson and Aldersmith and shows things as they were some years ago. Beneath it is an elevation view of the Giza pyramids showing their relation to the high and low levels of the Nile. Recently considerable evidence has been uncovered to say that the Pyramids were inundated with water at some time in the past. The Sphinx in particular demonstrates considerable water erosion around the base. This view of the plateau gives a good idea of just how much water that would require. The question must be asked is this erosion damage evidence of the Great Flood?. However there is an even stranger and more intriguing mystery of these pyramids because it seems that all three pyramids were positioned or place in a precise mathematical sequence. The sequence being the Fibonacci Series. The adjacent diagram shows the map of the previous page considerably reduced and over the top is curve of the Fibonaaci Series. It is clear that the curve passes through the apex of each pyramid. Bob Frissel in his book "Nothing in This Book Is True But It's Exactly How Things Are" states that Thoth told Drunvalo Melchizedek of this fact. This drawing of the relative sizes of the pyramids of the Giza Plateau highlights the difference between the first three pyramids with the remaining six. It emphasises the fact that knowledge was being lost, not gained. Wm. R. Fix in his book "Pyramid Odyssey" makes some extraordinary calculations about the size of the Pyramid and the size of the Earth. Taking the latest Geodetic survey figures he has discovered that the Great Pyramid is a scale model of the Earth at a ratio of 1: 43,200. He has done this by taking into account the estimated size of the Pyramid's base. A factor apparently overlooked by previous studies. What he has found is that this 1: 43,200 ratio is true to an accuracy of one or two millimetres in 480 feet, the height of the pyramid. He has shown that not only is the height of the Pyramid in direct relation to the Polar Radius of the Earth by this ratio but also the perimeter at the sockets at the base has the same ratio to the world's best estimates of the circumference of the Earth at the Equator. The ratio of the size of the Great Pyramid to that of its missing tip is precisely in the ratio of 56:1. If the Great Pyramid is successively expanded in that same ratio, three separate times, some amazing correspondences appear. This exercise shows a connections with the pyramid plateau, an association to all of Lower Egypt and a correllation to the circumference of the Earth. 1. If the Great Pyramid is expanded by the same ratio that the Great Pyramid has to the theoretical size of its missing tip, 56:1, then the area of the base of the expanded pyramid is exactly equal to the area of the plateau on which the Great Pyramid stands - Sixty four square miles. 2. Further if the now expanded pyramid is again increased in size, by the same ratio of 56:1, then the area of the base of this third pyramid is 200,700 square miles, this happens to be the area of Lower Egypt. 3. Lastly if this largest pyramid is again., theoretically of course, magnified by a further fifty six times, the perimeter of the new imaginary structure will be 25,085 miles. This distance is very nearly the same measure as the circumference of the Earth at the Equator - 24,902 miles. There were some 2,600,000 blocks of stone used in the building of the pyramid. We have just seen that the estimated mass of the pyramid is some 5.955 Million tonnes, therefore the average weight of these blocks is some 2.3 tonnes each. Many are at least 10 to 12 tonnes each and at least one weighs in at some seventy tonnes. The accuracy of construction is nothing less than awe inspiring, the enormous granite and limestone blocks are so precisely placed that the joints are, typically, less than one fiftieth of an inch in width. Moreover a cement was used that was so fine that it was able to cover areas as large as 35 square feet, in the vertical plane, as well as the horizontal and all in these minute hair line cracks. To give the reader a better idea of the sheer size of this structure - If all the stone in the Great Pyramid was sawed into blocks one foot on an edge and then laid end to end, they would stretch two thirds the distance around the Earth at the equator. In weighing up whether or not the ancient Egyptians built or were capable of building the Great Pyramid on their own we do not have to involve ourselves with the pyramid's incredible precision, its astronomy or its apparent predictive characteristics, we simply have to look to its size for our answer. Through time and particularly in the last century the Great Pyramid has been the subject of almost countless exhaustive investigations by legions of experts, architects, engineers, cosmologists, scientists, surveyors, even musicians and recording engineers have come to take in this marvel of the ancient world. The result of this intense focus of attention, the repeated measurements and the careful studied deliberations is that we can be very sure about the Pyramids absolute dimensions, its location on the Earth and the fact that apart from a few internal chambers it is certainly not hollow. The simple fact that the pyramid is not hollow leaves us with the mathematical certainty that there must have been some 2.6 million blocks of stone involved in its construction. This enormous number, this factor of scale could never have been taken into account when any analysis was made of how this building was constructed, for if it had the ramp concept of construction could never have lasted as long as it has. Through the centuries, the majority who came to consider how this building was constructed could never have made any careful study of just how long it would take to build a structure as large as this pyramid. In his book Chariots of the Gods? Erich Von Daniken makes the simple point that if ten blocks were laid each day it would take 664 years to complete the structure. This is based on the very elementary procedure of dividing the total number of blocks by ten. No one surely thinks that it took 664 years to build this pyramid, even a tenth of this period is unacceptable if the tomb theory of the pyramid is to have any merit. Yet constructing this pyramid in a time of 67 years entails that two-hundred thirty tonnes of limestone or granite were laid each day. This means that, on average, a hundred times every single day more than two tonnes of stone would have been precisely put in place. As each block has been carefully located next to its neighbours, very often with hairline precision, this entails that only nine minutes was allowed to place each block in an average fifteen hour working day. Nine minutes per each block of stone with little or no mechanical assistance, just levers and brute strength. This is surely quite impossible, even ten times that figure at 90 minutes per block is hard to credit. Probably one of the biggest red herrings in our understanding of the origins of the Pyramids comes from one of the most respected men in history, Herodotus. His writing style and his ability to communicate what life was like in his time casts a deceptive weave over everything he has to say. This is in no way meant to be either derogatory or defamatory, simply that he was so good at what he did that many people who read him do not look any further for the truth. All that Herodotus did was to put pen to paper and write down his thoughts and the stories that were told him. In the case of the Great Pyramid that largely amounted to recounting the tales told to him by priests or Arab guides. What is out of line here is that too many people accept what he has written without careful analysis. Often it could have been an anecdote that was related to him, and probably not a factual account but instead just an ancient Arabic or Egyptian fable. For example there is the story of Cheop's daughter and how her miserable father had sent her out to prostitute herself in a bawdy house to earn money for him. Apparently she not only did this but also persuaded each of her customers to contribute a stone for a pyramid. Eventually she had enough stones to build the middle subsidiary pyramid. An estimate of the number stones used in this pyramid is about 20,000. It is clear we cannot place credence on this tale. Then there is the priests account of how the Great Pyramid was constructed and of how it took twenty years to build. There are 2,600,000 blocks of stone in the Great Pyramid, to build the pyramid in twenty years would require that 130,000 blocks were placed in each year. That entails that, assuming a constant fifteen hour day throughout the years, and assuming slave labour conditions, one block would have to be placed every 150 seconds. With no block weighing less than ten tons and some blocks weighing nearly seventy tons the idea is quite preposterous. To be perfectly fair to Herodotus, it is not until you analyse this matter in some detail that the implausibility's of this account become evident. So unless Herodotus had made a similar study and was in possession of similar statistics, he could not have possibly ascertained that was told him was no more than a fairy tale. He certainly would not have known all of the incredible astronomical detail that has been presented in this book. We must assume that the tale that was told to Herodotus had slowly evolved over the centuries. For in his time he was as distant to Cheops as we are now to the Romans being defeated in Scotland and retiring to Hadrian's wall. The truth of the matter is that with our much improved knowledge, instrumentation and resources we are much more likely to arrive at the truth than ever Herodotus was. The passage and chamber system inside the Great Pyramid is the most complex by far of any other Pyramid in Egypt. For a long time this enigmatic structure must have appeared to be impenetrable. This was not to daunt the adventurous Caliph Al Mamoon however, he was a ninth century explorer, and he set his men to knock a great hole in a pyramid wall to gain entrance, this impromptu portal, called Al Mamoon's Tunnel, is still in use today. The general scheme of passages and chambers is detailed below. The main King's and Queen's chambers were given their names from ancient Arabic legend which described them from the nature of their ceilings. The King's Chamber has a flat ceiling so it was seen as male, the Queen's chamber is a vaulted ceiling so it became female. The Grand Gallery is an impressive access way that connects the King's Chamber with the passageways and rooms below it. It is raked at the same precise angle as the connecting Ascending Passage. The sheer size and volume of this rising passageway gives an indelible impression of an ascent to majesty. This is especially true when it is compared to the limitations and restrictions of its access in the earlier Ascending Passage. It is not surprising then that the end of the line for this regal access way is known as the King's Chamber. The King's Chamber is placed at the very heart of the Great Pyramid. Because of this very central location there is more than three hundred feet of granite and limestone pressing down from above. To relieve the enormous pressure of this rock the design employs a complex of five relieving chambers, one above the other, to reduce the effective weight on the King's Chamber below. The King's Chamber itself consists only of polished granite blocks, walls, floor and ceiling. No ornamentation decorates the bare room and no paintings adorn the walls or ceiling. The walls are made up of exactly one hundred stones varying in size. The ceiling is formed from nine enormous granitic beams, stretching from north to south, and extending five feet beyond each side wall. These granite beams are of greater depth than breadth and are arranged joist fashion. They are the largest, visible, stones in the whole pyramid. One of them has a breadth of five feet, a depth of about seven feet, and a length of twenty-seven feet, and weighs about seventy tons. The weight of Aberdeen red granite is 165 lbs to the cubic foot. The cubic contents of this roof- stone is 945 cubic feet, making the overall weight of this block slightly less than seventy tons. There is no known, or visible, block of stone in the Great Pyramid larger or heavier than this roof beam. The King's Chamber is the most significant area in the whole pyramid. People seem to be magnetically attracted to it. Probably the reason for this is that it is the most enigmatic and mysterious part of the whole building. For apart from a single coffer there is nothing else in it. Yet inside, in this King's Chamber, we find one of the earliest examples of the 47th proposition of Pythagoras -- A right angle, 3,4,5 triangle. The ratio of the north or south wall diagonal to the length of the chamber to the cubic diagonal of the chamber is exactly in the ratio of 3 : 4 : 5. 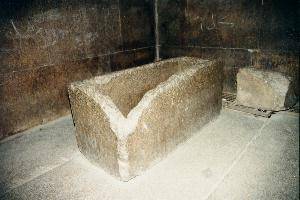 As we just have seen the sole occupant of the King's Chamber is an empty granite coffer thought by many to be some form of sarcophagus. However the more one probes the deeper mysteries of this artefact the less one expects to come across any rotted corpse it may have contained. The coffer is too big to have been brought in through the doorway of the chamber, therefore it must have been installed during the construction of the pyramid. It could only have been placed in the room when open space was above it. Further examination reveals that the coffer was cut from one solid piece of granite and most modern drill bits would fail miserably if they had been used to drill out its hollow centre. In other words the tools that were used to fashion this coffer were very much superior to most we use this century. Petrie estimated that a two ton pressure was needed to work this stone. These two facts alone stipulate that the tools in use when the pyramid was built were generally superior to most that we use today. The word tools is used because we have no idea how this coffer was fashioned, we can only surmise that it might have been a drill that worked this stone. In any event it is clear that some advanced technology was available when this coffer was fashioned and we can definitely place that time as being when the Great Pyramid was built. Therefore the idea that an ancient Egyptian stonemason was capable of shaping this coffer's precise dimensions is as implausible as the premise that a rubber bullet is capable of piercing armour plating. "And we must now strive to ascertain, on methods both absolutely new to Egyptology, and which must have been totally unknown to all Pharaonic serfs of old Egypt, what the Great Pyramid itself may have to add to this; viz. : its own preliminary setting forth of some very high science reason why this vessel before us, the coffer in the King's Chamber, is not only a symbolic sarcophagus, but one adapted likewise to something further and more expressively connected with capacity measure." Above the King's Chamber are five relieving chambers, one above the other. A relieving chamber is an architectural device to relieve the weight of a mass of masonry above something. It is in the first of these chambers, amongst a collection of construction hieroglyphics, is what is believed to be the cartouche of the pharoah Khufu. It is this cartouche that attributes the ownership of the pyramid to Khufu or as he is otherwise known - Cheops. Wm. R. Fix in his book "Pyramid Odyssey" points out that the Great Pyramid was only attributed to a king called Khufu because of these few marks and these are the only evidence of writing in the whole pyramid. Moreover some of the marks are inverted, indicating these inscriptions were on the blocks of stone before they were placed in the building. The situation is further complicated by the fact that the name Khufu is not the only name recorded in cartouches in this chamber, there are others, there are actually more of them and these read Khnum-Khuf. This dilemma of ownership is further aggravated by the fact that no one knows who or what Khnum-Khuf was. The only other place that the name Khufu appears is on the rocks at Sinai. This is what the famous pyramidologist Flinders Petrie wrote about these inscriptions. "The only great royal inscription [of Khufu], like that of Sneferu [his immediate predecessor, according to most Egyptologists], is on the rocks at Sinai. There are two tablets: one with the name and titles of Khufu, the other with the king smiting an enemy, and the name Khnum-Khuf. This raises a difficult question, to which no historian has ever given a satisfactory answer. Who was the person designated as Khnum-Khuf? That he was not a successor is evident by the name being used indifferently with that of Khufu in the quarry marks inside the Pyramid, and by his not appearing in any of the lists..."
Fix points out that no one really knows who Khufu was, or for that matter who Sneferu, Dedefra, Khafra or Menkaura were either. He goes on to say that if there ever was a Khufu he was probably named after the Pyramid not the Pyramid after him. From all this then we cannot be at all sure when this Pyramid was built or who or what it was built for. In short what we know of the origins of this Pyramid is all simply conjecture based on some vague Arab story. One of the main questions that arises from any discussion about the Great Pyramid is the contention that we cannot know what the units of measure used by the designers and builders of the structure were. So if we do not know what units of measure they used how can we determine anything else? The fact is they told us, or they certainly left a number of clues that tell us, what those measurements were. Moreover they left that message in TIME itself. The basic unit of measure that was used in the measurement of the Great Pyramid is either known as the Pyramid Inch or sometimes the Primitive Inch. There are 36,525 Pyramid or Primitive Inches in the designed perimeter of the Great Pyramid, 36,525 just happens to be the number of days in one hundred years. 36,525 is also the number of books of ancient wisdom, credited to the Egyptian God Thoth, reported by the Egyptian priest Manetho (3rd Century BC). Thoth was known as Hermes in Greek and these books were referred to as the Hermetic writings. Legend has it that it was an architectural genius called Hermes that designed the Pyramid. There is little doubt that Thoth, Hermes and much later, the Roman Mercury were all embodied with the same identity. The identity of Hermes or Thoth, having travelled the centuries from the very origins of this incredible pyramid. So how can we justify this Pyramid or Primitive Inch measurement. 1. The direct, straight line, measurement corner to corner. This is the base of the triangle just described. 2. The actual length across the rock surface. This is the top and sides of the triangle just described. 3. The theoretical length of the sides of the triangle before it became flattened out or truncated. All of which is pretty boring, insignificant, or just plain useless. That is until you convert the first unit to the length of the Mean Equinoctial Tropical Year in days - namely 365.242 days. A. The Sidereal Year or the duration of the Earths Solar revolution in days - 365.256 days. Thus the length of the Pyramid Inch is defined and it turns out to be 1.00106 British Inches, an amazingly close correspondence to our present day standard. If all of this seems improbable, impossible and a figment of the imagination then the introduction of the Sacred Cubit will add to the surprise. It is accepted that twenty five Pyramid Inches equals one Sacred Cubit in other words in one Sacred Cubit there are 25 Pyramid Inches. Precisely ten million Sacred Cubits equals 3949.89 statute miles and in 1957 satellite observations confirmed that the Earth's mean polar radius was the same 3949.89 statute miles. Thus the dimensions employed in the Great Pyramid are a direct function of the dimensions of the Earth to an accuracy of six digits. And this is to a standard that our current civilisation could not confirm until the year 1957! Other figures that emerge from the peculiar triangulation of the Great Pyramid's side are very close approximations to the maxima and minima (0.004 and 0.0019) for the eccentricity of the Earth's orbit and the diameter of the Earth's orbit (185,984,540 miles). It must be emphasised that the above is only a tiny fraction of the correspondences found in this incredible structure. The sole point of including this data at all is to give weight, significance and accreditation to a dimension that, otherwise, the reader might find somewhat bewildering and doubtful. The point must be emphasised that there can be little doubt as to the validity of the Pyramid Inch and Sacred Cubit, nor can there be any doubt that these dimensions were the product of a very advanced technological civilisation, that is, by any standards that we as a race might employ. Having defined these antediluvian units of length from a measure of time we now paradoxically and improbably reverse the process by measuring time from the lengths of the pyramid's internal passages. Not only the angles of the passages have a particular symbolism but also it seems their very dimensions have a relevance to Man's existence on this planet over the last four thousand years. Using a scale of one Primitive Inch to one year, every inch of passageway seems to fit the passage of time since 2623 BC. Someway down the Descending Passage from the entrance, forty feet two inches to be precise, there are two scored lines in the stone wall, opposite each other across the passage and perpendicular to the floor, . These lines give us a precise date and time, that being noon of the 21st March (the spring equinox), of the year 2141 BC. Astronomical research has revealed that these lines were in alignment with the star Alcyone of the Pleiades, in the constellation of Taurus the Bull, in the year 2141 BC. Evidence that this was the period intended that we start the dating system comes from the very angle of 26 degrees 18 minutes 9.7 seconds that is the elevation of the Descending Passage. For 26 degrees 18 minutes 9.7 seconds was also the elevation of the Pole Star, Alpha Draconis from the latitude of the Great Pyramid at 2141 BC. The Pole Star would have shone directly down the Descending Passage at its lower culmination in the third millennium BC. According to the astronomers the date of 2141 BC is the only time within the current precessional cycle when the alignment of both stars met these peculiar conditions. It is vital to understand that this is the only star alignment that fits these circumstances, no other alignments would suggest themselves as alternative considerations. Moving backwards in time from the year 2141 BC, at the rate of one inch per year, for a distance of 482 inches (forty feet two inches), we are arrive at the entrance to the Descending Passage, this corresponds with the year 2623 BC. The cartouche of Khufu found in the relieving chambers, supports this precise dating, this cartouche mark of the mysterious Khufu or Cheops does tally with this dating of the Great Pyramid's passage system. From this complex of astronomical calculations it is quite clear that this angle of 26 degrees 18 minutes 9.7 seconds was no mere accident of design and, as we shall see later, the fact that it is repeated once again in the angle of the Ascending Passage is all the more compelling. So in the year 2141 BC the star Alcyone of the Pleiades, in the constellation of Taurus the Bull, was aligned with the two scored lines in the stone walls of the Descending Passage. At the same time the angle of 26 degrees 18 minutes 9.7 seconds, that is the elevation of the Descending Passage, was the elevation of the Pole Star, Alpha Draconis from the latitude of the Great Pyramid. The Pole Star would have shone directly down the Descending Passage at this time. "According to the plan laid down in the time of the companions of Horus"
". . . towards the end of the fourth millennium BC we find the people known traditionally as "The Followers of Horus" apparently forming a civilised aristocracy or master race ruling over the whole of Egypt. The theory of the existence of this master race is supported by the discovery that graves of the late predynastic period in the northern part of Upper Egypt were found to contain the anatomical remains of a people whose skulls were of greater size and whose bodies were larger than the natives, the difference being so marked that any suggestion that these people derived from the earlier stock is impossible... The racial origin of these invaders is not known and the route they took in the penetration of Egypt is equally obscure." That, as Murry says, is well before the beginnings of Dynastic Egypt. If we compare the terminology "companions of Horus" and "followers of Horus" in terms of interpreting hieroglyphics, are we not talking about the same group that according to Professor W.B. Emery was 'The Masters of Upper Egypt'. The same group as shown by Professor Emery to be of much greater stature than the indigenous natives of the time, the same group of 'Masters' that seem to show a similarity, in size anyway, to the ancient Mayan legend of the Atlans, a race of giants? This new information does throw a considerable cloud over the idea that the Dendera Zodiac was actually created in 30 BC. In pursuing the premise that the ancient Egyptians were descendants of the Atlanteans, Murry Hope in her book "Atlantis - Myth or Reality" brings to light a parade of authors and evudence about the origins of pre-dynastic Egypt. "According to Cyril Aldred, during late Palaeolithic times the retreating ice-cap affected the climate of North Africa, causing it to become progressively drier. In Egypt the early pre-dynastic period, calculated from around 5000 BC to 3600 BC, encompasses the Neolithic and Chalcolithic periods. The Middle and Late pre-dynastic period is reckoned as 3600 BC to 3200 BC, after which we enter the realms of history. From Archaeological finds, we know that during the Amratian period there was an influx of broad-headed (brachycephalic) peoples the indigenous population of Hamites belonging to the long headed (dolichocephalic) type. All the evidence points to the fact that this spread of foreign influence in the fourth millennium BC came from the north." Spanuth agrees with this, asserting that in the Egyptian 8000 - 9000 BC there was no Egyptian state, no temple inscriptions and no papyrus texts. The Nile Valley was uninhabited (the first few remains in the area date from the fifth to sixth millennia BC and were found on the nearby heights while the Libyans make their first appearance in the records of Merneptah around I227 BC. In Greece there was no Athens to be conquered, no Acropolis, no Greek states and no Athenian armies. Nor had the Bronze Age made its appearance in weaponry or artefacts. And yet all these things are mentioned by Plato, and confirmed by other sources, so what is the answer? According to Herodotus, who received his information from the Egyptian priests, their written history dated 11,340 years before his era, or nearly 14,000 years prior to the present. A degree of support for this can be found in Ignatius Donnelly's quotation of other sources. "In the time of Menes the Egyptians had long been architects, sculptors, painters, mythologists and theologians." Professor Richard Owen says: "Egypt is recorded to have been a civilised and governed community before the time of Menes. The pastoral community of a group of nomad families, as portrayed in the Pentateuch, may be admitted as an early step in civilisation. But how far in advance of this stage is a nation administered by a kingly government, consisting of grades of society, with divisions of labor, of which one kind, assigned to the priesthood, was to record or chronicle the names and dynasties of the kings, the duration and chief events of their reigns!" "Egypt at the beginning appears mature, old, and entirely without mythical and heroic ages, as if the country had never known youth. Its civilisation has no infancy, and its art no archaic period. The civilisation of the Old Monarchy did not appear with infancy It was already mature." The Alsatian philosopher R. A. Schwaller de Lubicz assembled a great deal of Egyptian material over a period of ten years following a sojourn of fifteen years at Luxor (1936-51). His stepdaughter, Lucie Lamy, made detailed measurements and drawings of the stones and statuary of the great temple at Luxor that showed that the ancient Egyptians possessed a hitherto unsuspected knowledge of mathematics and cosmic form, which she later incorporated into her book Egyptian Mysteries. Schwaller de Lubicz himself was the author of several published works, notably Le Temple de l'Homme, which deals with the more esoteric aspects of early Egyptian culture. The ancient Egyptians possessed a solar, lunar and Sothic calendar, in fact Sothis, the binary star we know as Sirius featured strongly in their earliest history. It is my fervent belief that the Egyptians derived this information from the Atlantean priests, which goes to confirm the standard of knowledge that the scientific community of the Old Country had attained. Schwaller de Lubicz tells us: "The Sothic cycle is established on the coincidence every 1,460 years of the vague year of 365 days with the Sothic (or Sirian) year of 365¼ days. All civil acts were dated according to the vague year composed of exactly 360 days plus the five epagomenal days consecrated to the Neters: Osiris, Isis, Seth, Nephthys and Horus. The Sirian, or fixed year, was established according to the heliacal rising of Sirius, yet the interval between two heliacal risings of Sirius corresponds neither to the tropical year, which is shorter, nor to the sidereal year, which is longer. For it is remarkable that owing to the precession of the equinoxes, on the one hand, and the movement of Sirius on the other, the position of the Sun with respect to Sirius is displaced in the same direction, almost exactly to the same extent. Calculations established by astronomers have demonstrated that between 4231 and 2231 BC, the approximate duration of the reign of the Bull, Hap, the Sirian year was almost identical to our Julian year of 365¼ days. This period would cover the entire Ancient Empire, 'and we cannot but admire the greatness of a science capable of discovering such a coincidence because Sirius is the only star among the "fixed stars" which allows this cycle. It can therefore be supposed that Sirius plays the role of a center for the circuit of our entire solar system." Hephaistos Helios Agathodaimon Kronos Osiris and Isis Typhon Horus Ares 12 Dynasties of further Gods 4 Dynasties of Demi Gods. Now the importance of this distant period in Egyptian history is made clear, the real meaning becomes evident, for these 'Gods' as the Egyptians called them were probably The Companions of Horus, Atlanteans, seven feet high, possibly with blue eyes and fair hair. Surely this is the rationale of Cancer being so prominent in this Zodiac. Notice also that the importance of these Gods diminishes with time. For the original Atlantean genetic factors were being progressively assimilated into the developing Egyptian character and thus less and less evident or distinguishable, or god like. "A coptic papyrus Abou Hormeis (translated into Arabic in the ninth century) indicates the date of the Atlantean cataclysm: 'The deluge was to take place when the heart of the Lion entered the first minute of the head of cancer'. From the scholar Makritzi (fifteenth century) we learn that 'fire was to proceed from the sign of Leo and to consume the world'. These ancient sources imply that the Zodiacal sign of Leo the Lion was the time in the precession of the equinoxes, when Atlantis came to the end and a new cycle was born." Therefore we now have, Edgar Cayce, the Dendera Zodiac, a Coptic papyrus, Makritzi, and Plato all pointing to a similar period. It seems the evidence is mounting, so what can we deduce happened at this time. There seems to be little or no evidence that Egypt or the Egyptians were an identifiable nation or even a country at 10,000 BC. What we may assume is that the natives were in much smaller groups, possibly even tribes, certainly not the organised social structure that we identify with the large nation of a much later time. Because of this there is a problem with constructing this gigantic Pyramid that has not emerged before. That problem is quite simply how did they get all that stone to the Pyramid site if there were so few people and so little organisation to get it there. The answer to this dilemma came in a surprising fashion, the very vehicle that brought this solution was a television program, possibly designed, to debunk ideas such as those presented in this book. In their "Horizon" series the BBC presented a program about how modern day archaeologists and stonemasons set out to build a Pyramid to simply prove that it could be done. During the course of this adventure they discovered that the source of the stone for the Great Pyramid had not come from down the Nile, as many had surmised, but from the base of the very plateau that the pyramids are sited. This revelation solves a logistical problem that would be difficult to overcome otherwise. For with this local source of stone the need for thousands upon thousands of toiling slaves to transport the stone is completely eliminated and the construction of this megalith becomes a possibility with a relatively small number of people. A band of people similar to the description given us by Cayce in his dream. A band of people headed by a priest called Ra Ta, and assisted by a woman called Isis and the architectural genius of a man called Hermes. This intrepid band of adventurers now had the three 'M's of the triangle of creation, the material, the method, and the motive. But will we ever really know?. The precise location and placement of the Great Pyramid on Earth suggests that it is a building of supreme importance. It's location at the precise centre of the geometrical quadrant formed by the Nile delta intensifies this focus. It is aligned to within one twelfth of a degree to the cardinal points of the compass. The design of the Pyramid is such that it is able to model a globe. The Great Pyramid models the Earth in both its height and perimeter at the base at a ratio of 1:43,200. The Great Pyramid reflects the area of the plateau on which it stands, the area of Lower Egypt and the circumference of the Earth at the Equator. Astronomy and time are also reflected in the design. The orbit of the Earth and the distance of the Earth from the Sun are both revealed in its dimensions.. The length of a Great Year of (25,826.4 years) is indicated by the sum of the diagonals in the structure. The Great Pyramid is also able to model nature in that the internal ratios in its design fit the Fibonacci series. Further we saw how it is possible to establish the basic unit of measurement used in the pyramid's construction. Namely the Pyramid or Primitive inch and how that unit is very closely related to the standard British Inch of today's measurements. We also saw how that inch measurement is a function of planet Earth's mean polar radius to an accuracy of six digits. That the maxima and minima of the Earth's orbit are reflected in the design. That the Earth's orbit of 185,984,540 miles is reflected in the design. That the length of the Solar Tropical Year, of 365.242 days is a key factor to its design. That the length of the Sidereal Year, of 365.256 days, is a key factor to its design. That the length of the Anomalistic Year, of 365.259 days is a key factor to its design. To understand the full significance of the passages of the Great Pyramid it is necessary to realise that this building was more a temple than a tomb and as a temple is primarily concerned with the spiritual growth of the human soul. The Ascending Passage then represents Man's path back to God whilst the Descending Passage points to Man's inevitable degradation without Gods help and guidance. It is hardly frivolous then that the import of the Descending Passage in terms of human morality is echoed by the very star that it is aligned with. The Dragon star, the then Pole star, Alpha Draconis, was traditionally associated with the forces of evil and a spiritual death. Moving down the Descending Passage, now in a forward or southerly direction, we arrive at the junction of the Ascending Passage and the Descending Passage this point, calculations reveal, represents the year 1453 BC. Precise interpretations of the significance of this year are impossible, however in a general sense this period points to Moses receiving the ten commandments on Mount Sinai, the "Exodus" of the Jews from Egypt, the era of the Upanishads and the composition of the hymns of the Hindu Vedas. We now have a choice of which direction to take upwards towards spirituality or downwards to some spiritual death, let us take the upward path. Moving up the Ascending Passage, which symbolically is very physically cramped, we suddenly emerge into a large ascending chamber, called the Grand Gallery. At a scale of one Primitive Inch to one year, this opening out into the Grand Gallery represents the year AD 33. The connection between the teachings of Jesus Christ, the crucifixion, the explosion of enlightenment, and the entry to this large regal gallery is unmistakable. The Grand Gallery continues upward at the same angle of 26 degrees 18 minutes 9.7 seconds for what is nearly 1900 years in chronological measurement. This gallery symbolises the upward movement of awareness amongst the enlightened in the world. For the average person this upwards journey is physically quite difficult but by no means impossible, it seems to demonstrate that the spiritual growth of the human soul is not an easy path to take. At the very top of the gallery we arrive at a large step in the path, it has been titled the Great Step for it is nearly three feet in height. The location of this Great Step corresponds to the year AD 1845, it is significant that this date marks a central point of a hundred year period when the emancipation of the working classes and the abolition of slavery was prominent. Man's humanity to his fellows was at last being generally legislated in the world by civilised society, does this Great Step symbolise that difficult transition for humanity? Now at the top of the Grand Gallery our forward progress is marked by a low entrance way, leading to the Ante Chambers of the King's Chamber. The date that this entrance marks is crucial for it is AD 1914 the start of World War 1, indeed the spiritual horizons of the whole world were severely diminished by this event. The transition of the remainder of the 20th century is marked by the dimensions of this constricted entrance. Perhaps symbolising the limited spiritual horizons in a period of great materialistic growth. The entrance now opens out into the much larger and higher Ante Chamber of the Kings Chamber and the date that marks this new high ceiling of awareness is the year AD 1999. It has been prophesied by Jean Dixon, Mario de Sabato and Edgar Cayce that the years AD 1998/AD 1999 mark the advent of a new spirituality emerging in mankind. The symbolism of this short entrance way opening out into the Ante Chamber in the year AD 1999 is therefore quite noteworthy. In many ways the dimensions of this Ante Chamber seem to reflect the dimensions of the pyramid as a whole, it is not surprising therefore that many see the this Ante Chamber representing the material and physical world being brought to spiritual perfection. The next major feature we encounter is the "Granite Leaf", this consists of two blocks of granite, one above the other. These blocks are cemented into grooves cut in the sidewalls of the Ante Chamber and the whole is effectively suspended just below the ceiling. The upper block appears to be broken off from above and is marked with a sunrise or a rainbow symbol. Peter Lemesurier in his book "The Great Pyramid Decoded" speculates that this symbol is very close to the Egyptian hieroglyph for a loaf of bread. Taken in conjunction with the "broken off" top of the leaf and the apparently messianic dimensions of the boss, he sees this symbol as representing some form of Messianic Bread sent down from heaven. He also points out that this is precisely the imagery reputedly used by Jesus of Nazareth. The interpretation of this "Granite Leaf" is that in AD 2034 there will be a sign in the cosmos of the imminent arrival of the new Messiah to herald the sunrise of a new age. By the year AD 2039 this Messiah will have taken up his physical role on the Earth. This date of AD 2039 is significant for the writer finds that it closely corresponds with quatrains of the great seer Nostradamus. There are further messianic visits indicated in the 22nd and 23rd centuries, whilst the general messianic and preparatory influences of this Ante Chamber extend to the year AD 2499. The last date to be identified in the Great Pyramid is the year AD 3989 when Peter Lemesurier sees that the human species will no longer be bound to a mortal existence. Having now explored the upper regions of this pyramid let us pluck up courage and see what is indicated by the lower regions of this building. As one might expect, the Ascending Passages and the Grand Gallery point to a humanity seeking out spiritual perfection. Therefore it is not surprising that the Descending Passage indicates a humanity proceeding toward spiritual death and degradation. The lower Descending Passage does not continue always in a downwards direction. At a point that equates to the year AD 1521, the passage levels out and continues in the horizontal plane. Therefore it may be presumed that something changed the downward direction of the path. It is intriguing that the year AD 1520 saw the beginning of the Anabaptist movement in Germany under Thomas Münzer, whilst in AD 1521 Pope Leo X conferred "The defender of the Faith" on Henry VIII, Luther began his German translation of the Bible, and just eleven years later in AD 1531 Henry VIII was recognised as the supreme head of the church in England. After this change in direction the Descending Passage continues in the horizontal plane until it reaches the entrance to the Great Subterranean Chamber and the year AD 1914. The Great Subterranean Chamber is an ominous place, hewn out of the very bedrock of the plateau, the walls and ceiling are cut in typical pyramid precision, however the floor is a mess. Rubble and boulders litter everywhere, and toward one end of the chamber is the gaping opening of an enormous pit. There are clear indications of the First and Second World Wars and slumps in civilisation in the 1970's and again at the beginning of the 1980's. It is when we get to AD 2004 that the bottom really drops out of everything and it appears that here, if it is not too careful, humanity slides into a seemingly bottomless pit. All this seems pretty horrific but there is a route around this obstacle in the way of mankind. The way is difficult and tricky but you can avoid this disaster if you try, for back up the Lower Descending Passage is an escape route to the Grand Gallery. If this escape route is ignored it seems the pyramid is warning that everything we have created will disappear, economics, trade, religion, philosophy - everything slides into the pit. Across the other side of this pit is a dead end tunnel that represents the path of no escape for the unenlightened. This dead end tunnel continues in this way for some five hundred years or more. There are some intriguing parallels in this underground architecture, the entrance to the chamber is, as we have just seen, chronicled by the year AD 1914 and the first world war, whilst the edge of the pit is calculated to be the year AD 2004. The descent into the pit is abrupt and once at the bottom the journey continues at rock bottom for about twenty eight years. emerging in the year AD 2032. This closely parallels Nostradamus who, the writer interprets, in two quatrains prophecies that in AD 2003 a twenty seven year rule of Saturn will start on the earth. There would be nothing more Saturnine than the bottom of this pit! Each of these events has been accompanied by an architectural change, or feature that seems to support the very ethic of the event occurring at that date. If you accept this premise then the message of this pyramid is difficult if not impossible to ignore, the essence of this epistle of numbers, or the narrative of these dimensions is: Reformation or destruction, the path is upwards or downwards - Its your choice! If for any number of reasons you find the foregoing a little difficult to accept then you might care to consider the following factors in addition to those already detailed. One of the most striking comments I have heard recently was in reference to Mans struggle with his environment. In this context then it was stated that in Man's struggle with ecology Man had won and Humanity had lost. For there is no greater truth that a Godless society is on a downward spiral toward disaster, the technological race ever accelerating the pace toward ultimate destruction. It must be said that technology cannot of itself exist without the mind and consciousness of God giving it both direction and purpose. This is symbolised in the Pyramid by the two main passage ways, the Descending and Ascending Passages. It would be fitting therefore if the Pyramid was to give some sign, some pointer, to clarify this message. Almost since the beginning of time for the western world, there has been one spiritual event that has overshadowed all others, an event so important that all our dating systems have been reset by it. We get so used to BC and AD that we forget the compelling significance of these abbreviations. We have already seen that the Great Pyramid seems to identify the birth of Christ in its dating system, is it able to confirm this intention for us by indicating the Christ by some other method of measurement - We think so! Life on planet Earth must be at all times a compromise between reality and spirituality. In geometric terms we might call this a vector. Is there then a vector in the Great Pyramid that points to or expresses the birth of Christ, if so where would we look for it. If the symbolism is correct the most likely place to find this vector would be the angle that the Ascending Passage makes with the horizontal. Taking the floor of the Queens Chamber as the horizontal, the Ascending Passage makes an angle of 26 degrees 18 minutes 9.7 seconds with that horizontal, if now on a map, on an east-west baseline, we apply that vector of 26 degrees 18 minutes 9.7 seconds from the Pyramid eastward, we find that it points precisely at Bethlehem. Can this be coincidence, if so then the chances are greater than 2 or 3 million to one. With all of the other evidence it must be interpreted as being the precise intent of the architect. All of the above may seem a little too much to swallow if it were not for a number of factors. These factors need to be identified one by one if we are to make any value judgement on this incredible phenomenon still located on the outskirts of modern day Cairo, indeed as it has done for countless thousands of years. Firstly the accuracy of the measurements, they cannot be doubted for they have been confirmed time, after time, after time. Secondly the accuracy of the construction, that has been confirmed by the measurements tells us it was no primitive race with only wedges and pulleys that built this pyramid. This structure is the result of a very advanced technological civilisation. A civilisation we need not give a name to, but if necessary it could well have been the Atlanteans, Whatever, it was a civilisation that not only understood and practised astronomy but also was very familiar with the science of predicting the future and they were good at it too! Thirdly many of the dates that have been revealed are so in line with the history of the Christian Church that they are compelling, especially the change of direction just when Martin Luther was translating his new Bible. This does not mean that is was Christians that built it, for by definition that was an impossibility. What it does indicate however is that the pyramid's authors understood the spiritual direction for Planet Earth not only at this time but throughout the ages. Also, by implication, it shows a high degree of Christ Consciousness, a much older version of the same theme delivered by Christ himself. Next the amazing correspondence with the identity of the Christ and using an entirely separate measurement, namely degrees. To identify the birthplace of Jesus Christ is quite amazing for surely it highlights the fact that they were probably aware that we would need this corroboration. This is emphasised by the extreme lengths they went to make sure that we did not miss it. In addition do not forget that this precise angle of the major passages of the pyramid not only points to Bethlehem on the map but it was also the elevation of the Pole Star in 2623 BC. Next is the extraordinary correspondence with the year 1914 not in one place in the pyramid but two. In both cases the pyramid warns of a dramatic change in conditions on planet Earth, and in both places it shows a very limited horizon both spiritual and material for all of mankind. Remember 1914 did not only signify the start of World War I but it was also very close to the Russian Revolution of 1916 and in Ulster the Irish were very close to civil war. The dramatic changes in the world as a whole in 1914 are dramatically represented by this entrance to the Great Subterranean Chamber and the low tunnel into the Antechamber. That same low tunnel entrance that we find ourselves in today and will continue to be so for the next three years. However it would be true to say that now we can see some of the heavier clouds lifting and we can feel a new spiritual vibrancy and awareness starting to influence our everyday life. So for many of us the prediction of 1999 heralding a new dimension in awareness is not at all unexpected. Whilst the prediction of the material world sliding into an abyss in seven or eight years time may be to be very drastic, it is also seen by some to be quite on the cards. Especially considering the very tenuous state of the world at this moment in time. Everything is very much poised on a knife edge and it would not take much to cause a slide into virtual oblivion. This is particularly emphasised by the many Millennium prophecies that exist. Revelations, Nostradamus, Edgar Cayce, Cheiro, Jean Dixon, the Miracle at Fatima are just some of the many. This author is also a contributor to this list because there is a profound correspondence between the nature of people born after the year 2000 and that indicated by the Great Pyramid in the years 1999 and 2004. In both cases a correspondence is clear. In the 27 year duration of the pit in the subterranean chamber from 2004 to 2031 we see a corresponding indifference, apathy and lack of concern for others shown in a considerable proportion of those born after January 1st 2000. As we saw in Chapter Two, paradoxically at the same time there will be a deep, and profound spiritual energy that pervades the whole population. What has to be identified and the question that must be asked is could we as astrologers today do anything like the same thing that has been achieved in this Great Pyramid, I think not. The prime reason for this is I feel that for far too long now the sciences of Astrology and Numerology have been part of the dark ages. The facts are that this example of forecasting has lain silent for the entire length of our civilisation as we know it and even now the majority of the population do not acknowledge it. Maybe it is because for the first time we are able to begin to understand it. In any event it must remain silent no longer.